Fond of Snape » Blog Archive » Mondays aren’t so bad! Saw this article today and I swear it made me tear up: “That’s how Heath would want it“. I was on the subway yesterday and overheard someone say “Heath”, so I started listening instead of zoning out, as I usually do on the subway, and sure enough they started talking about The Dark Knight and how great Heath Ledger was in it. Damn it that I have a weekly meeting on Tuesdays, which is the cheap night at the local theaters. Hmm…maybe I can sneak out a bit early this week? Or what the hell, I’ll just catch the 9 PM show. My kind of boss; one I can joke with, go out with a drink with, be there for and know she’ll be there for me. What did she want to see me about? It’s bonus time…and let’s just say I got the bonus of my dreams, and that she is very, VERY happy with me…and I with her! And that made me tear up, too. Good damn thing I didn’t wear mascara today! I was interrupted in the writing of this by Dad calling to say he’d fallen and needed help. He’s ok…he just couldn’t get up and I couldn’t lift him; thankfully, the firefighter next door was home and he got Dad up. Nothing broken, nothing cut, so I stayed home, fed him dinner and am keeping an eye on him. Now if he would just listen to me about NOT trying to take the dogs out! They are fine with going out around 8 am and then again around 6 pm. Dad said Wolf was acting like he wanted to go out, be he’s just freaking out at the pestilence of flies we’re currently experiencing. End of the world, anyone? Amityville Horror? 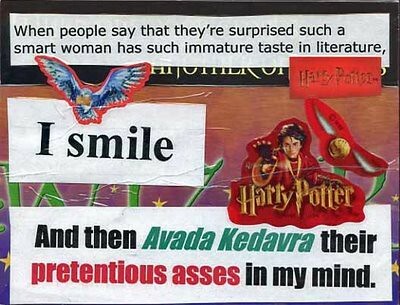 finally…a PostSecret I can relate to! Not that I’m such a smart woman, but I can relate to wanting to put a spell on someone…maybe not the Avada Kedavra, but a silencing spell, maybe? Wow! That bonus *does* make for a good Monday! Wow. Great Monday. Glad your dad is ok, and I agree with you on that Post Secret. I felt the same way when I saw it. Hmmph. Awesome news about the bonus – congratulations! I’m glad that your dad is okay too. Wooohoo Congrats on the bonus – that’s awesome!! Whatcha going do with the $$? trip?!! I’m sorry about your frustrations with your Dad… have a good punching pillow? I think the GOP cast that silencing spell on a certain someone just last week. I’m glad your dad is okay. Woo hoo!!!! Congrats!!! That is so great! And very cool that Heath’s daughter will inherit, thanks for sharing that. I’m really happy that your dad is OK.
I’m glad someone’s economy is doing okay! I hope your dad is ok- that’s always so scary. Yay you for the boss & bonus, and for your dad being okay (and having a firefighter next door…). Congrats on the bonus….getting a new lens?? I would love a silencing spell. I swear Liv jibbers jabbers from sun up to sun down. I have learned to tune it out, but dang she can talk! Hey a good Monday! Congrats on the bonus! So glad your dad wasn’t hurt! I love that Post Secret! I think a good slug spell is good too! I’m glad your dad is okay! And it’s about damn time! I’m so happy you were rewarded correctly! Yay for the excellent bonus. That is fantastic news, especially in these economic times. I’ve been lucky in that my new boss is a good one, an all around sweet guy. I’m glad your dad is OK. But that call had to be so scary. I guess the positive thing is that he wasn’t hurt. I’m sure he wants to be able to do things and his body won’t always comply. I’m glad your dad was ok and that you got a lovely bonus. I meant to ask about your dad, but spaced. Congrats about the bonus! So how will you celebrate? Glad your dad is ok.
Just moseying over here to check on you and leaving you a booty/gem comment. I see that your boss found Capt. Jack’s treasure chest of dubloons before he did and is sharing “something shiny” with you! Congrats on that bonus, my lips are zipped on the find when I see Capt. Jack tomorrow am at Java Joes Jolt! Hope your Dad is doing better. Wow, congratulations on your awesome work news! That’s wonderful! Glad to hear your Dad wasn’t hurt. Sometimes Dannan goes twelve hours without going outside (and don’t worry, I’m home with him when he does this! Don’t call the authorities!). Your Dad sounds really sweet, hope he realizes that he shouldn’t try to let them out. Congratulations on your bonus! And I love the PostSecret.